I picked up Shea Moisture Coconut & Hibiscus Curl Enhancing Smoothie last year on a trip to New York but didn’t get round to trying it until a few weeks ago. Shea Moisture is a very popular line for curly-haired women. The company was founded by Richelieu Dennis twenty-five years ago inspired by the recipes created by his grandmother. Shea Moisture products are all natural and don’t contain parabens, phthalates, mineral Oil, DEA, petrolatum, formaldehyde or propylen. The company also manufactures an argan oil & raw shea butter, Jamaican black castor oil, manuka honey and mafura oil, red palm and cocoa butter, manuka honey and yogurt as well as sacha inchi oil collection. Shea Moisture Coconut & Hibiscus Curl Enhancing Smoothie comes in a 12 oz jar. It thick, creamy and smells delightful. Shea Moisture Coconut & Hibiscus Curl Enhancing Smoothie was formulated to define curls, reduce frizz, restore moisture and make hair soft and silky. Does it do that? After shampooing and deep conditioning, I worked Shea Moisture Coconut & Hibiscus Curl Enhancing Smoothie through my hair in sections. I finished off with my homemade hibiscus hair gel and sealed with my hair oil mix. I wore it as a wash and go for the day and in a high bun for several days afterwards. On application, my hair absorbed the product but I was concerned it would leave behind white spots. Those concerns were eliminated as my hair dried. The outcome was soft and bouncy hair with reasonably defined curls. After shampooing and conditioning, I applied a water based leave-in conditioner followed by Shea Moisture Coconut & Hibiscus Curl Enhancing Smoothie. I let the set air dry then sealed lightly with grapeseed oil after taking out the curlformers. I then finger combed it. My hair was shiny and soft and remained so for a few days before my next wash. I liked both of the methods used above and will alternate between the two. 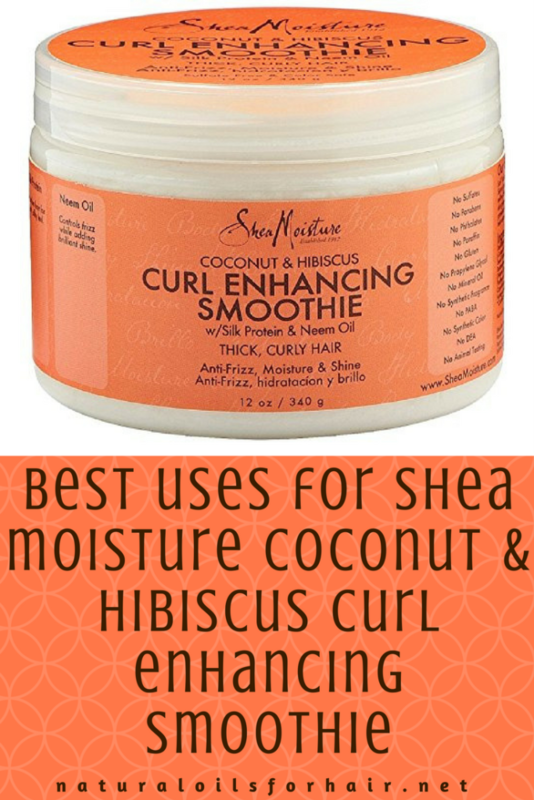 Shea Moisture Coconut & Hibiscus Curl Enhancing Smoothie will also work best on wet hair. I tried it on a patch of dry hair initially and it just sat there doing nothing. Soft, silky and/or shiny hair is possible depending on how you use it. You can mix and match to find the right application for you. 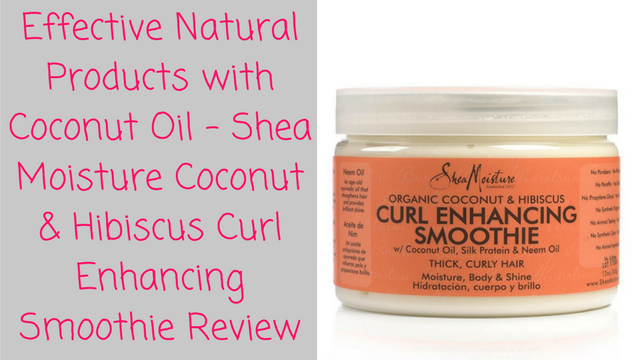 Shea Moisture Coconut & Hibiscus Curl Enhancing Smoothie doesn’t dry out the hair. Shea Moisture Coconut & Hibiscus Curl Enhancing Smoothie comes in a huge 12 oz jar. With only a little required for each use, this jar will last for a while. 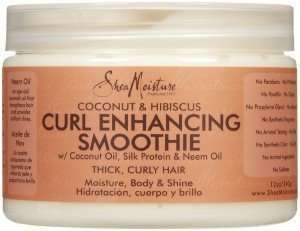 Shea Moisture Coconut & Hibiscus Curl Enhancing Smoothie is produced with certified organic ingredients. The price is very affordable and they’re usually on sale on sites like Amazon and Sally Beauty. You can use it in many ways – wash and go, leave-in conditioner, braid outs, twist outs, LCO and hair setting cream. Some people might find the scent of Shea Moisture Coconut & Hibiscus Curl Enhancing Smoothie overpowering but it usually disappears within a few hours of application. Takes a bit longer to dry when used with rollers, perm rods or curlformers but you can apply sit under a hood dryer for 30 minutes to reduce the drying time. It would be easier to control application and reduce risk of product contamination if it came in a bottle. Shea Moisture Coconut & Hibiscus Curl Enhancing Smoothie may cause build-up if too much is used. A bit on the heavy side so works best for type 3C – type 4C hair type. Deionized Water, Butyrospermum Parkii (Shea Butter)*, Cocos Nucifera (Coconut) Oil*, Macadamia Ternifolia Seed Oil, Magnifera Indica (Mango) Seed Butter*, Persea Gratissima (Avacado) Oil, Vegetable Glycerin, Aloe Barbadensis Leaf Extract, Silk Protein, Ammonium Salt, Melia Azadiratcha (Neem) Seed Oil,Daucus Carota Sativa (Carrot) Seed oil, Sorbitol Esters, Panthenol (Pro-Vitamin B-5), Caprylyl Glycol, Essential Oil Blend, Lonicera Caprifolium (honeysuckle) Flower (and) Lonicera Japonica (Japanese Honeysuckle) Flower Extract, Tocopherol (Vitamin E), Hibiscus Flower Extract. Where to Buy Shea Moisture Coconut & Hibiscus Curl Enhancing Smoothie? Overall, I’m pleased with the results and will continue to use Shea Moisture Coconut & Hibiscus Curl Enhancing Smoothie. My final verdict is 8/10.